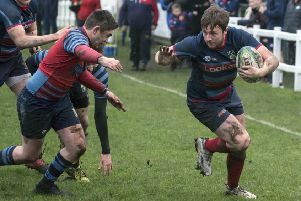 South Shields Westoe kept their promotion hopes alive with a battering 20-10 victory over second placed Barnard Castle. Right from the off the two sides put down their markers with strong running and fierce defence. The first score came after 10 minutes with a Castle penalty due to a Westoe offside, but minutes later the score was level with a similar penalty. It was 20 minutes in before the crowd were given their first try. Castle’s Upton spotted a gap and kicked a long ball which he gathered himself for the easy run-in. With the half coming to a close, Westoe strung together a series of forward drives and Jamie Preston broke through to level. The battering continued into the second half, with powerful drives from two determined teams. 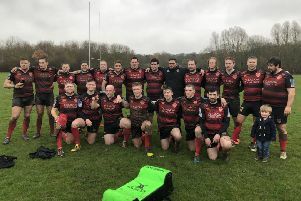 A Castle line-out was stolen and spun wide where a quickly recycled ball found its way to John Younghusband, who powered his way over the line to edge his team ahead for the first time. With a quarter left to play, Westoe increased their lead with a penalty for offside, after another promising attack was stopped over the line, the ball being stripped from Richards’s hands as he dove over the line. Castle threw everything at Westoe in the last 20 minutes, but a splendid defensive display prevented any further scores. The victory keeps up the pressure for the promotion race between Westoe, Durham, Castle and Consett. With Durham likely to secure the league title, the second play-off stop is still up for grabs. Although Consett have a game in hand and Castle are five points clear, they both have very tough run-ins, having to play each other and Durham in the final games. Westoe, however have an easier route on paper. Due to the recent adverse weather conditions, all four league contenders are faced with several midweek games. Westoe face Gateshead on Wednesday for another must-win match.